PartyCheap has what you need to build the foundation for a great tropical island party! Our Tropical Island Insta-Theme, Backdrops, Backgrounds & Props will transform your party venue into sandy beaches on a lush green island! 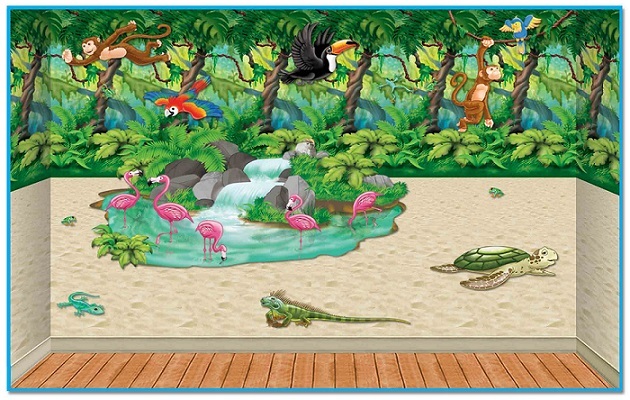 PartyCheap’s tropical backdrops measure 30 feet long so that they can cover a great deal of wall space. To have the complete look of the tropical island, you would need the Beach Backdrop for the lower half of your walls and the Jungle Trees Backdrop for the upper half. You could then layer the Tropical Props on top of the backdrops to feature the animal inhabitants of your tropical island. You can also be one of the tropical island’s creatures with PartyCheap’s Soft Animal Ears Headband! These tropical island backdrops and backgrounds create a beautiful foundation for all of your other Tropical Island Party Decorations! Please browse our Monkey Decorations to add more island friends to your party’s backdrop. The decorating fun only begins with the Tropical Island Backdrops and Backgrounds.